Recently, NASA’s JUNO spacecraft slowed down by 1,212 miles per hour in a carefully coordinated 35 minute maneuver. This slowdown is similar to you slamming on the brakes to stop your car on the highway in 2 seconds. Braking to the exact right speed allowed JUNO to be captured by Jupiter’s gravity and start orbiting the giant planet. Just like a long road trip, as spacecraft travel from Earth to their destination, they often cruise at high speed to reach their destination in a relatively short amount of time. But that means if you want to orbit or land on the planet, you must slow down a lot. Here are three ways NASA has dealt with the tricky task of ending a planetary road trip. Contestants on the TV show “The Biggest Loser” may not be “losers” after all. A recent study of Season Six contestants has revealed that six years after the show ended, most of the participants regained a substantial amount of weight. For those unfamiliar with the show, overweight and obese contestants compete for a cash prize by demonstrating the greatest weight loss by percentage. Along the way, contestants receive coaching from trainers and nutritionists. So, after achieving their weight loss goals and learning the keys to weight loss, why do they gain the weight back? This summer, you may be thinking of having fun with friends in a swimming pool or relaxing in a spa. However, facing the clear and inviting water of the pool, you may want to know: what’s really in the water you are about to get into? Former President Jimmy Carter was diagnosed with stage IV malignant melanoma in 2015, an aggressive form of cancer that spread to his liver and his brain. Until recently, this would have been a death sentence. However, after surgery, radiation therapy, and a new type of drug treatment, Jimmy Carter is now cancer-free. Nanomedicine: How Much Are We Willing to Pay? In 2013, cancer affected approximately 14 million people in the United States, and its direct medical costs were almost $75 billion, making cancer a devastating disease from both the human and financial perspectives. Nanotechnology may offer some relief, but at what cost? 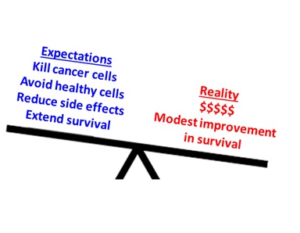 Comparing nanotechnology expectations and reality in cancer treatment. The taxi driver went quiet, as if lost in thought. I waited, kept patient by that mysterious gut feeling that someone is about to say something. Conversations about what I do often lead to this question – in taxis, on buses, even once in a nightclub. It’s a question that led me to pursue a career as a cancer biologist. People ask because, despite all the news articles about promising treatments and breakthroughs, cancer is still common. Over half a million people are predicted to die from cancer in the US in 2016. A cure for cancer may not be impossible but it is elusive, for a few reasons. Duke undergraduate student Amber Oliver shows off the 3D printed rig which supports and stabilizes the camera. This summer, an afternoon spent flying kites at the beach will be just another day at work for some researchers at the University of North Carolina at Chapel Hill. Now that classes are out of session, Elsemarie deVries and Evan Goldstein don their sandals and sunscreen haul kites and cameras to the Outer Banks in the name of science. They are coastal geologists who study how beach grass and sand dunes affect each other. These researchers are part of a “21st-century renaissance” of scientists who use kites to collect geographic information. 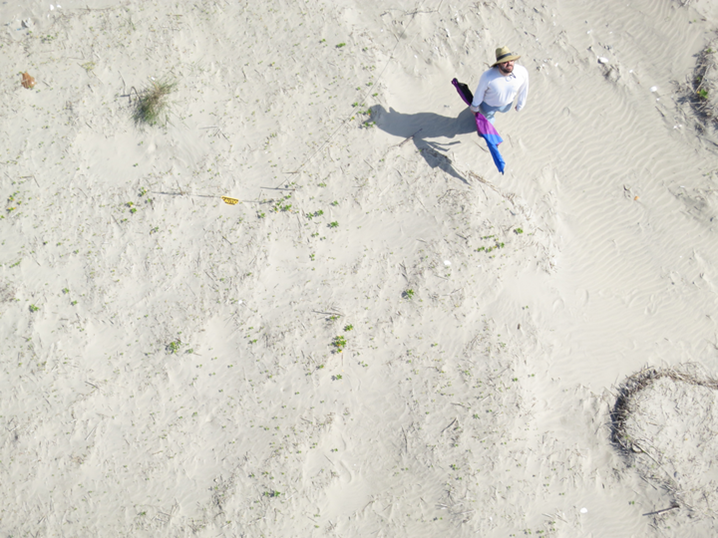 A camera cradled beneath a kite snaps a collection of what Goldstein calls “higglety-pigglety images” from all over the beach. Once they get back to the lab, the team uses software to stitch these pictures together into a 3D map. 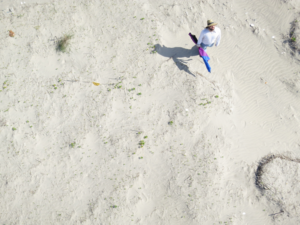 With enough data, they hope to understand how dunes grow. To attach real dimensions to their maps, the researchers roam around on the beach with a GPS unit, noting the coordinates of specific locations. In a pinch, anything can be a ground control point – on one memorable day, dog-poo bags marked the GPS locations (although deVries is quick to point out that the baggies contained only sand – not feces). Although many people find the beach a relaxing place, Goldstein says that some of these trips to the coast have actually been “pretty stressful.” Particularly windy weather can sour a field excursion since strong wind can send the kite into a nosedive. To solve this problem, Goldstein dove headfirst into the physics of kite flying literature (yes, that exists), and the team picked up a more stable kite with a keel. Evan Goldstein snaps a selfie with one of the airborne cameras. Both images courtesy of Evan Goldstein. Now that they know how to capture these bird’s eye images and turn them into topographic maps, Goldstein is setting his sights on “capturing time series – going back to the same site repeatedly over and over again.” They hope that building a series of 3D maps will show them how plants and dunes change together. Taking pictures with kites instead of, say, drones, which are increasingly used for aerial photography, may seem delightfully quirky and old-fashioned, but cost and legality make kites an appealing option. Even though the kind of kites able to support a camera cost a little more than tuppence for paper and string, they can still be less pricy than drones. Goldstein also points to “the regulatory advantage” as a key reason that kites will be keeping this research aloft in the upcoming months. 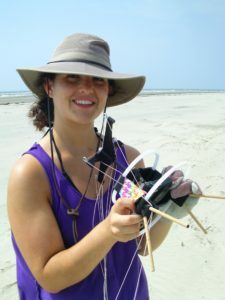 Author’s note: Although I am not involved in the kite mapping project, I am a MS student in the same lab as Dr. Evan Goldstein and PhD candidate Elsemarie deVries, under the direction of principal investigator Dr. Laura Moore. Dr. Kenneth Ells of UNC-Wilmington is an additional collaborator on this project.